Have you got an anime fan in your life and have no idea what to get him or her for Christmas? Don’t worry. From series on Blu-ray and streaming subscriptions to figures and jewelry, there is plenty out there awaiting your selection—so much so that a few tips might be in order. So here are some DOs and DON'Ts when it comes to shopping for an anime fan, courtesy of Kotaku East. DON'T worry if the current favorite anime of the person you are buying for isn't on DVD or Blu-ray yet. Even these days it still takes months for a popular anime to see a Blu-ray/DVD release in the West. There are other options. DON'T buy bootleg DVDs/Blu-rays from Hong Kong or Singapore. Bootleg anime is often a total crapshoot. Sometimes the quality is great, but often it has just been taped off of Japanese TV. Moreover, the subtitles can range from perfect to unintelligible, and you’ll never know which it is until you've purchased it and watched it for yourself. DO buy a Crunchyroll account. Crunchyroll is a video streaming site like Hulu or Netflix—but for anime only. Moreover, Crunchyroll releases its anime fully subtitled in English—and usually the day that it airs in Japan. While there are other anime streaming services, Crunchyroll offers the widest selection of new anime each season. And though there is a free version of Crunchyroll, a paid account gets new episodes a week earlier and in HD quality for as low as $6.95 a month. If your anime fan already has a Crunchyroll account, consider a Funimation account or a Hulu Plus account. Both services have an impressive anime back catalog that’s more than enough to keep any anime fan interested. 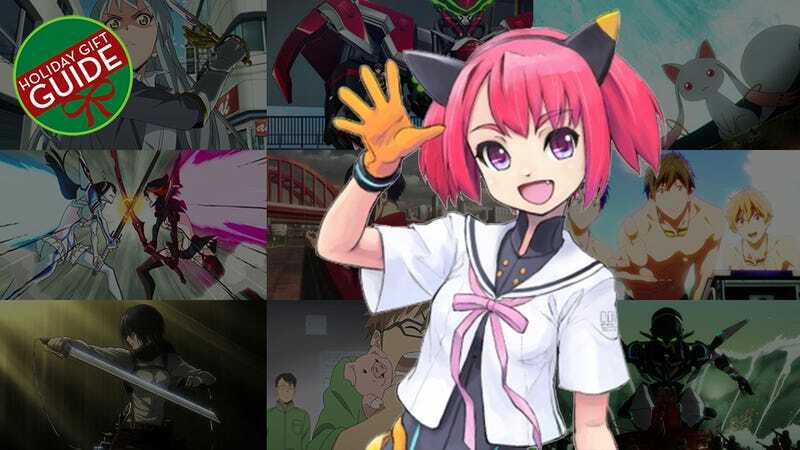 And if you are looking for anime to recommended be watched with this gift of streaming anime, Kotaku East has you covered. DO share your own favorites. If you are an anime fan yourself, giving an anime you have enjoyed (but that the person you’re buying for hasn't seen yet) is always a good bet. While he or she may not enjoy it quite as much as you did, it’s always great to share something you love. And what’s more fun than having a friendly “argument” about the pros and cons of your favorite anime. DON'T buy something at random just because it’s “anime.” There is a lot of anime out there ranging across every genre you can think of—fantasy, sci-fi, romance, comedy, and slice-of-life, among many others. In fact, there are 49 new anime airing right now. Buying an anime series, figure, or other accessory because it’s anime and he or she “likes that anime stuff” is also a bad plan. So be sure to ask the anime fan on your shopping list for the names of his or her favorite series if you choose to go the merchandise route for a gift. DO gauge how the one you’re shopping for presents his or her anime fandom to the rest of the world. If his or her room is filled with wall scrolls (cloth posters) and figures, then it is safe to buy those. If no such “evidence” exists, and you still want to buy anime-related merchandise, it’s better to buy something more discreet like a ring or necklace. Once you have an idea what you are looking for, hit up a site like JBOX (which is filled to the brim with every anime accessory you can imagine). DON'T be afraid to buy small. A keychain or cell phone accessory is often as welcome as a several hundred dollar statue. DO buy something Studio Ghibli related. If for some reason you can’t ask that “favorites” question of your anime fan, getting something Studio Ghibli is almost always a safe bet. There really are very few anime fans out there who hate Studio Ghibli's amazing films. DO consider buying manga. Many anime are based on Japanese comic books (called “manga”). Often, these manga are different in how they tell the story and/or continue the story past the point where the anime ended. These days many of the most popular manga get an English language release and can be found anywhere from Amazon to Barnes & Noble. Have your own tips for shopping for an anime fan? Feel free to drop your own suggestions down below.